You say tomato, I say mater . 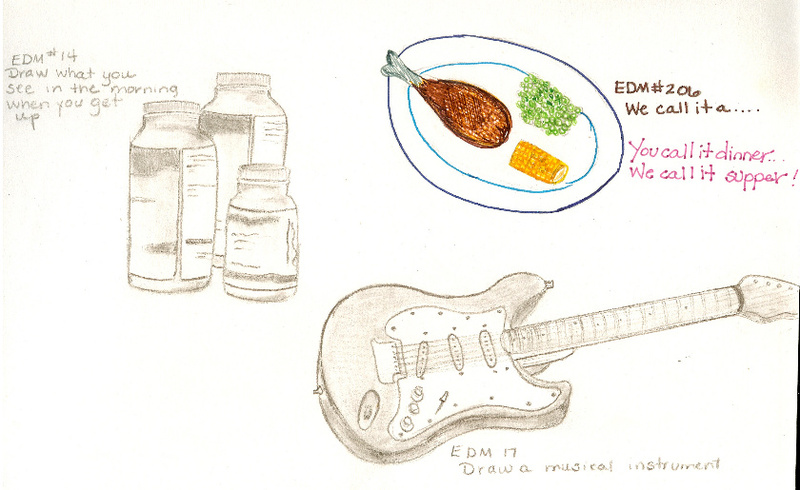 . .
EDM # 14 is my vitamins. I have to keep them on my dresser so I will remember to take them. EDM #17 Is the electric guitar that my daughter got for Christmas. EDM#206 is a new challenge and we call it suppa not dinner. Back home lunch is dinner and we call it dinna. We went out to eat with some friends on the 40th birthday of my sister and myself. It was a very nice restaurant in a renovated old church. We had so much fun and at the end, the husband of a couple ask me how I liked the food. I said, “Suppa was really good.” He turned to me and said, “Suppa, what the hell is suppa? !” I am almost sure he knew what I was referring to, but chose a smart remark to belittle me, so I replied, Suppa is when you share food with people you love and dinner is food you share with people you don’t and then I walked off. Of course I didn’t mean it, but I wasn’t going to let him talk down to me I think he was drunk. Idiot! Let me see if I can remember more stuff : going shopping=goin’ to town, tractor trailer=transfairy truck, aluminium=a -lyewn-yum, yours=yalls-is, and=’n, bologna-bolonie, alot=a mess, ing=in’, tomato=mater, potato=tater. If my Granny Lucy was still around I’d have a bunch for you. I guess you can take the girl out of the country, but you can’t take country out of the girl, and that is completely a okay with me. Your husband is not an idiot. He’s the smartest man alive. Just ask him! He knows how to cure allergies. You forgot ill, pronounced eeelllll and meaning bad tempered, not sick. carol remember side meat (fatback) yall (you all) RECKON thats all ican think of. we are the ones that are sane.